A rapid transformation in musical tastes occurred in the years around 1500, with the relatively widespread distribution of part-music in the new medium of print � it was in this context that the consort of viols emerged. For their third recording on Delphian, the Rose Consort use a set of instruments modelled on those depicted in an Italian altarpiece dating from 1497 in Bologna. Peerless early-music mezzo Clare Wilkinson joins the consort in a sophisticated interweaving of voices that casts revealing light on the earliest music for this innovative ensemble. Rose Consort of Viols� recent engagements have included performances at the BBC Proms Matinees at Cadogan Hall with vocal ensemble Tenebrae, at the National Gallery in London and for Semana de Musica Religiosa in Cuenca, Spain. 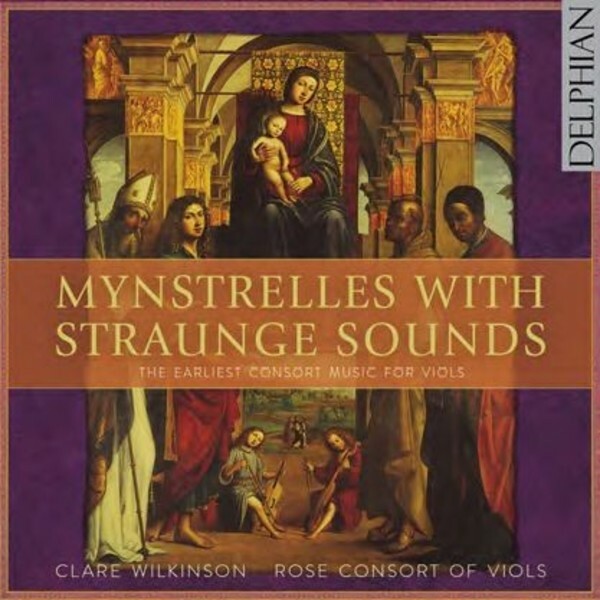 The Rose Consort of Viols has received awards for its research and performance of newly devised programmes, and has made a number of highly acclaimed recordings for Delphian and other labels. For the more refined music, both sacred and secular, which forms the bulk of the collection the Rose Consort offer performances as good as you are likely to hear from a viol consort and Clare Wilkinson puts aside her Mummerset opening mode to excellent effect in the vocal items. An all-viol programme might have been a little too much of a good thing; as it is, the balance is just right. With good recording and very helpful notes, this is a first-class album.